Where there’s a will, there has to be a way. And rules be danged, but young Dave Riley was going to do whatever it took to catch Howlin’ Wolf doing his thing. On the West Side of Chicago in the early 1960s, state law said that young ‘uns, like Riley was at the time, were not allowed to venture into the local clubs and juke joints, hotspots where men like The Wolf and Muddy Waters were playing on a nightly basis. So instead of actually setting foot inside those clubs, the resourceful Riley came up with another solution. That determination to accomplish a task, no matter what the odds, has served Riley well, whether in his day job as a prison guard, or in his night job playing the blues all over the globe. And globetrotting all over the world is something that the guitar-playing Riley and his partner-in-crime, harpist extraordinaire Bob Corritore, have been well-versed in the past several years. Riley seemed genuinely touched by the reception that was bestowed upon them during their recent European jaunt. Riley, who calls Illinois home most of the time, and Corritore, a major fixture on the blues scene from Phoenix, Arizona, met somewhere in the middle – the Natural State. And from that, a partnership was forged. That union of Riley and Corritore has resulted in a pair of terrific albums to date – Lucky to be Living from 2009 and 2007’s Travelin’ the Dirt Road. And as the burgeoning duo found out while prepping for their debut disc, it wasn’t necessary to burn up a lot of time and energy in the pre-production stages of the disc. Riley was born in Hattiesburg, Mississippi, in 1949 and spent the first 12 years of his life there and in nearby Prentiss, Mississippi. It was there that Riley first came under the spell of what would later become a guiding force in his life: the Blues. Like a host of other Mississippians after the Second World War, the Rileys eventually left the south for the Windy City of Chicago and its numerous opportunities in the mid-’50s. It was his family’s move from the city’s North Side to a housing project on the West Side that would turn out to have a dramatic impact on Dave Riley’s life. But in the beginning, not everyone in Dave Riley’s family shared in his love of the blues. Riley’s passion for the blues has remained a constant presence since then, even though playing the blues on a full-time basis has not always been. He took a 25-year sabbatical from performing the blues, instead focusing on raising his son and working at his day job as a prison guard at Joliet State Penitentiary. His return back to music in the mid-’90s found its momentum in a spot that is revered as holy ground in the world of the blues – Helena, Arkansas. One thing’s for sure – you weren’t going to be playing with Frank Frost and Sam Carr unless you could deliver the real-deal blues. Luckily, that was never a problem for Riley. Riley was set to record with The Jelly Roll Kings, but Frost’s passing in 1999 kept that from happening. Instead, Riley soon found himself in the middle of a new ensemble – The Delta Jukes. Featuring Carr, Riley, James and Brinkley, Arkansas’, own John Weston, The Delta Jukes recorded Working for the Blues in late 2001. And he’s doing it with all the soul and passion that he can muster. “Blues is a feeling. When it’s done right, you can feel it. And if you can’t feel it, you can’t play it. You can’t fake it. A lot of musicians want to try and put too much into it (the blues), or not enough into it, but you have to have just the right ingredients,” Riley said. Sometimes that act of making people feel good is as moving for Riley as it is for the people in the audience. 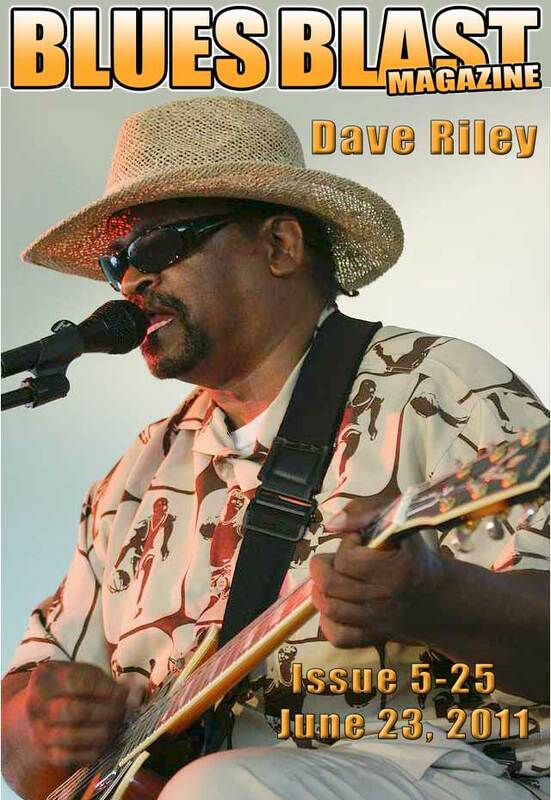 With a new disc from Riley and Corritore on the horizon for this fall, it looks like it is full speed ahead for Dave Riley and the blues, regardless of the current musical trend. Interviewer Terry Mullins is a journalist and former record store owner whose personal taste in music is the sonic equivalent of Attention Deficit Disorder. Works by the Bee Gees, Captain Beefheart, Black Sabbath, Earth, Wind & Fire and Willie Nelson share equal space with Muddy Waters, The Staple Singers and R.L. Burnside in his compact disc collection. He’s also been known to spend time hanging out on the street corners of Clarksdale, Mississippi, eating copious amounts of barbecued delicacies while listening to the wonderful sounds of the blues.